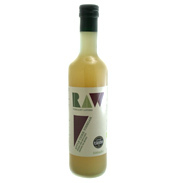 At RAW Health they use organic unfiltered, pressed apple juice to make their raw apple cider vinegar. Never heated or pasteurised, this living enzyme-rich vinegar contains the nutritious vinegar 'mother'. Perfect for salad dressings, sauces or as a health tonic. Mix with a little honey to calm an irritating cough. Gargle with water as a natural way to sooth a sore throat. Ingredients: Apple vinegar - certified organic ingredient.